Petite multi-color chandelier, Italy, circa 1960. Small-scaled form with original, playfully colored painted elements, which include pivoting shades. Teak & Perspex chandelier, Italy, circa 1960. Elegant form with teak and metal construction and (6) cylindrical perspex shades. Opaline suspension chandelier by Philips, Netherlands, circa 1960. Eleven cascading opaline cylindrical shades in various sizes at adjustable heights. Stilnovo suspension lamp, Italy, circa 1960. Beautiful opaline glass shade with black metal fitter. Measures: 18.25" diameter x 7" height (fixture); 25" height (total drop). 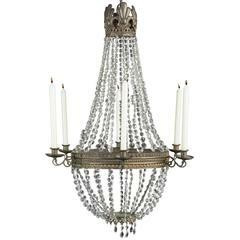 Crystal Candle Chandelier, Italy, circa 1870 Cascading crystal elements with bronze details. Holds (6) taper candles. Overall height is adjustable. 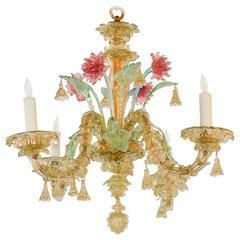 Exquisite four-light antique Murano chandelier handmade in Italy. A multi colored jewel! Ready to install, circa 1920. Measure: 23 inches height x 24 inches wide. Beautiful and unique Arlecchino ball chandelier. Made with a Murano glass ball and scegge and glass pieces. Beautiful effect both when it is on or even when it is off.